Do you live in the Glendale area or will you be visiting during the month of September? If you’re looking for something fun and exciting to do in Glendale and Peoria, we’ve recommend some activities for you and anyone else in your family who might want to tag along! Check out our top picks below for the next time you want to get out and about in the Glendale area. Do you love teddy bears? Are you looking for some wholesome family fun in the Glendale area? If so, check out the 13th Annual Teddy Bear Day on September 9! This event will be held at Murphy Park in Glendale from 10am to 4pm. Walk around town and check out special deals and discounts that will be going on during the teddy bear festivities and don’t forget to stop by the Visitor Center for more information about all the excitement! Kids in the family can enjoy arts and crafts activities at many locations throughout the area during Teddy Bear Day, too. As part of Glendale’s Fall Family Movie Series, you can bring yourself and the whole family to the Sahuaro Ranch Sports Park for a fun night filled with movie magic! This is a recurring event that takes place on a monthly basis so don’t forget to check back again in October and see what’s happening next time, too. For September, the movie is Moana. Bring along your picnic blanket and snacks to enjoy a comfortable night outdoors on the grass at the park. Don’t forget to arrive an hour early so the younger members of the family can enjoy some fun activities before the show starts! Admission is free to this event. If you prefer an activity that’s a little more grown-up, don’t forget about U2 in concert at the University of Phoenix Stadium in Glendale on September 19! This exciting event is sure to draw big crowds, so get your tickets ahead of time if you want to enjoy the show. Tickets are still available! There’s even more going on in the Glendale area during September and in the months ahead, so don’t forget to check out the local events calendar to find out more. You never know when you might come across something you’d love to go do with your friends and family the next time you want to plan for something exciting! Mark your calendar for a family fall event in October that will include complimentary photos and pumpkins! Click here for more info. 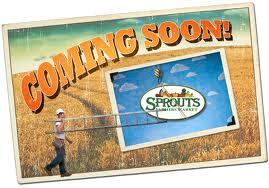 Sprouts Farmer’s Market will be opening a new store at 67th Ave and Deer Valley, in the old Basha’s location. Basha’s left in 2009 and ever since then residents have been lobbying for Sprouts to take its place. The 27,000 square foot store will open in August and employ about 80 people. Check out their website for job postings. For those not familiar with Sprouts, it is a neighborhood grocery with the feel of a local farmers market. You will find fresh fruit and vegetables, specialty foods, gourmet cheeses and barrels of whole grain nuts and sweets. Thousands of natural, organic and gluten free foods to help you make healthy choices for you and your family. Oh and their fruit and vegetables…sweet, ripe and their prices are great. There is a lot of excitement in the community and we are all looking forward to having our very own neighborhood grocer. For more information on Sprouts, check out their site.